The private Music Album culture is coming back and this is really good news! Ever since record labels drifted away more towards bollywood music, it has only been the digital platform where musicians have been able to present their music to the fans and ArtisAloud.com has been at the forefront promoting and distributing music albums and singles by various artists for three years. That’s the short & sweet digital story but now what’s really good to see is that some record labels are also supporting private music albums and at the forefront of this is Crescendo Music. Crescendo Music, in fact is a record label one would immediately associate with private music albums, with them having released music albums of some of the first Indi pop artists such as Baba Sehgal, Daler Mehndi, Piyush Soni, Sukhbir and more. 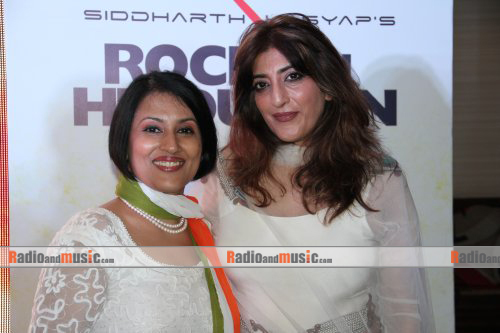 And now, Crescendo music has just launched a brand new music album titled `ROCK ON HINDUSTAN’. We’re in 2013 & it’s the age of technology, where entertainment is seamless & at your fingertips. What if music celebs too were at your fingertips? We would say It’s already happening, with `The Ehsaan Noorani Voice blog’ on ArtistAloud Voice. ArtistAloud.com, which launched its IVR portal service called VOICE in India early this year, is bringing this exclusive entertainment content to all mobile subscribers in India. Ehsaan Noorani, the guitar guru who forms one part of the popular music composer trio Shankar – Ehsaan – Loy is the man in picture here. 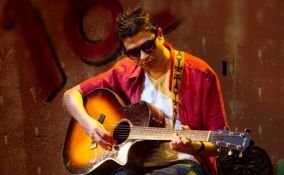 Music lovers and fans all over till now have known him as a guitarist but `The Ehsaan Noorani Voice Blog’ gives them the chance to know the musical, personal & the professional side of this talented Musician. Simply, by dialing in 5464611, mobile subscribers in India will be able to connect to ArtistAloud Voice, follow the instructions & listen to this exclusive celeb Voice Blog, where celebrity musician Ehsaan Noorani, each week will talk about topics as varied as his musical influences, performing live on stage, working with different directors, S-E-L and his Talking Pet cat! The service has been launched exclusively on Voice 5464611 – ArtistAloud.com’s IVR portal which mobile users in India can subscribe at a price of Rs 30 per month. Apart from The exclusive Ehsaan Noorani Voice blog, the portal also offers great top 10 music, chat shows, rockumentaries & artist interviews. The service is currently live on the Uninor, MTS & Vodafone mobile networks, with other networks to follow soon. The talent hunt kicked off in sync with the release of Indian Pop star Chin2 Bhosle’s new song titled `Coming Home’. The song ` Coming Home’ is a soothing melody which has Chin2 Bhosle singing along with the legendary diva of Indian Music, Asha Bhosle. The talent hunt is aimed at finding a special female vocalist, where in the winner will get to re-record the song `Coming Home’ in her voice with Chin2 Bhosle. The winner will also get a chance to meet Asha Bhosle & also win a guitar autographed by the legendary diva. Starting 7th of January, the entire online talent hunt activity will be carried for six weeks on the artistaloud homepage. In the initial stage, to Participate in the online talent hunt, users will have to first log on to www.artistaloud.com & download the song `Coming Home’. Then they would have to record Asha Bhosle’s part in the song in their own voice and upload on ArtistAloud.com.Entries will be registered for the first 2 weeks, post which the entries would be screened by Chin2 Bhosle & Asha Bhosle. At the end of 6 weeks, the selected winner, chosen by Asha Bhosle herself will be finally declared. Bombay Jayashree in the race to the oscar !! It’s great to see another Indian Independent Music artist getting global attention. ArtistAloud.com is eagerly awaiting and hoping to see her bag the Oscar !! We’re in the middle of a roller coaster ride that started 3 yrs ago and being in the driver’s seat, excited to the maximum just like a little child is AVP Soumini Sridhara Paul and the entire team!! She describes these 3 years of ArtistAloud as `The Beginning, Challenging, Fulfilling, Endearing & Evolving ‘ ! Team ArtistAloud in these 3 years has been a one of a kind platform for popular music outside of bollywood. A web platform that started with just 30 artists is today a large database of music content featuring songs, videos & artists. Going into the New Year 2013, it’s all happening on ArtistAloud with more music entertainment and more social interactivity …..Left right up or down, it’s a nonstop roller coaster ride on ArtistAloud !! A Car, A Movie, A Party, all in one and all for free !! So what is the single most important element you need to make and release a feature film, especially in today’s age? It’s a big budget… isn’t it!! No, that’s not really true…. Creative ideation, passion and a confident desire is all you actually need to pull off a feature film and release it too!! REB RIBBON music and film Maker Tejas R Padia prove it with their movie titled `LO HO GAYI PARTY’. This is no ordinary effort, LO HO GAYI PARTY is bollywood’s first ever Zero budget movie!! Yes, you heard that right, Zero budget!! The movie has been in the making since January 2010, and every aspect that goes into the making of a film such as scriptwriting, music, casting, shooting etc has been done professionally. The team has been able to pull off a feature film with literally zero budgets with the help of likeminded passionate creative people who have supported the project in the logistics and resources required. ArtistAloud too has partnered with the team and is digitally releasing the Music of the film. Lo Ho Gayi Party is a story of 5 friends, Vasu, Shibu, Vani, Aby & Teddy who desire to have a luxury car. They manage to get a car, but a drunken situation that goes beyond control changes the course of the story. What happens next is a roller coaster comic ride! The music of the film , which you can download is very commercial and runs along the storyline. The title song Lo Ho Gayi Party and the song Ooh La La are instant foot tappers!! Lo Ho Gayi Party the movie releases officially on Red Ribbon Musik’s you tube channel on the 4th of January at 11 pm. It’s a Friday and is possibly the best and the cheapest way to a first day first show ! Top 10 songs to party on ! This is the top 10 playlist for your new year party ! Simply Click on the images to download the songs !! Welcomes 2013 and Welcomes you to its home !